Sunday morning is a cool dry day. Perfect conditions for the pain that lay ahead of us! 10:00am and all nine teams are weighed in, competitors weighing between 78 and 85kg. I just scrape in at 85kg and Jordan easily makes weight at 80kg. Lots are drawn for the running order. We draw 5th for the first event, team tyre flip weighing 400kg for as many reps as possible in 75 seconds. The first four teams score between 12 and 14 reps. Our aim is 16 reps, thinking this will be enough to win this event. We get 16 with seconds to spare! The last team to go get 17 reps! Second place in first event, a good start! Next event is Farmers deadlift for reps, 95kg in each hand. Jordan gets a solid 20 reps in 75 seconds. Good start, I manage to add 28 reps to make a total of 48 reps. This is enough for 3rd place in the second event. 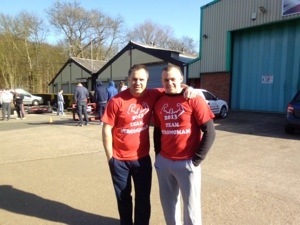 Next up is the team loglift, an extra long two man log loaded with 140kg of weight. This is gonna be fun! We crank out 6 reps but get a dubious decision on 1 rep and only given 5. Fourth place in 3rd event leaves us in 3rd place overall at the halfway mark. We are then rewarded with a well earned break of half an hour to refuel for the next half. 4th event is the dreaded medley, all items to be carried 20 metres in relay fashion 60kg dumbbell, 80kg log, 105kg axle and finally 160kg duck walk. Brutal! We get fourth place! Penultimate event is Frame carry for 20m, frame weighs 360kg plus! We do it in 12 seconds! Good enough for 4th place again. 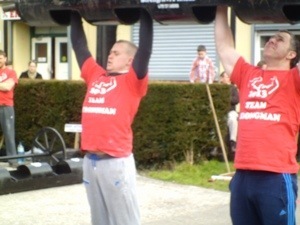 Last event is arm over arm drag, a sled weighing over 360kg. This event causes a bit of controversy as only three teams are able to move the monster sled over the concrete car park. We are one of the three teams and come third in the last event. Joint 3rd overall, I am gutted! Good start to the season. We had a great day, met some great people and by the end of the day we were both completely chin strapped! So back to EVO to get stronger for the next one!! 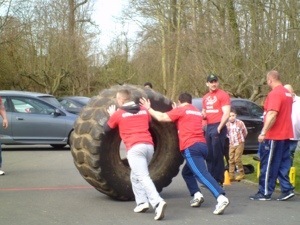 This entry was posted in Strongman and tagged Jordan Mitchell, lee Parkes, Strongman, Team Evo on March 16, 2013 by billybicep.